Starting on the trading floor at First National City Bank in January 1973, William Ferrell has been trading securities and derivatives and managing traders for over four decades. Mr. Ferrell came to New York with a B.A. in Economics and History from Hampden-Sydney College and a five-year game plan that evolved into a life-long career in financial risk management. After 11 years at Citibank as a trader, underwriter, salesman, and financial engineer, Bill joined Kidder Peabody & Co. as the Manager of the Municipal Securities Group and as the youngest member of the Board of Directors. While managing one of the three largest trading operations in the industry, he participated in the firm’s management process as a member of the Operating and Inventory, (capital and risk allocation) Committees, and, ultimately, the Management Committee of the firm. In 1988, Mr. Ferrell founded Ferrell Capital Management to offer risk consulting and risk-managed investments to large money center banks. Solving capital and risk allocation issues for financial institutions has resulted in the development of a comprehensive tool kit of methodologies and measurement algorithms. He pioneered the concept of managing investment accounts to target volatility levels and has created proprietary methodologies for allocating investment capital. From 2000 through 2011, he was the Chief Investment Officer for a fund of over 100 hedge funds providing an opportunity to work with many of the world’s finest money managers. Today, Concert Asset Management stands out as an investment manager with a unique set of tools and applications to manage assets for traditional investors. Utilizing the powerful advantage of artificial Intelligence to manage market exposures, we offer the Concert AI strategies. Mr. Ferrell has published numerous articles on portfolio performance optimization. He occasionally speaks before major investment firms and institutional investors on ETFs, risk allocation/management, and the employment of artificial intelligence in the investment industry. 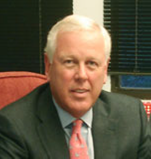 In addition to serving as a Trustee at his alma mater, he has been involved with the Greenwich Roundtable, the Economic Club of New York, as well as several philanthropic organizations, including the Advisory Board of Outward Bound; and, currently, as a ruling elder of The First Presbyterian Church of Greenwich. He is an avid sportsman and musician. Craig W. Schulenberg is the Technology Architect for CONCERT AI. He has contributed as a Consultant, Computer Scientist, and Principal Member of Technical Staff for a number of software and aerospace firms, including Charles Stark Draper Laboratory, MIT Instrumentation Laboratory, MRI Technologies, China Lake Naval Weapons Center, IBM Federal Systems Division, Intermetrics, Inc., and TRW Systems. Mr. Schulenberg has designed and developed compilers as well as flight software for spacecraft ranging from Project Apollo to the shuttle and now is creating programs for the NASA Space Launch System. Craig received the Silver Snoopy Award from NASA astronauts for technological achievement which promoted their safety in space. In 2000, Mr. Schulenberg initiated the development of an innovative and highly accurate stock trading system based on physics principles from thermodynamics which have been proven to accurately model market behavior. His early model has evolved into a neural net-based expert system and is the heart of Concert AI. John is Multimedia Creative for Concert Asset Management (admin1@ConcertAssetManagement.com). He has contributed to software design, development and test projects since the 1970's in medical electronics and broadband communications for SmithKline, Moberg Medical, Motorola, SeaChange, Xfinity, and a number of consulting clients. John created the website for Concert Asset Management, contributes to media production, and plans to develop social media outlets and apps to broaden awareness for CAM strategies and future ETF offerings. John holds a B.A. in Mathematics and Physics from East Stroudsburg University and an M.S. in Computer Science from Villanova University. He specializes in development and testing for the user experience of embedded and web-based software systems, as well as web and multimedia production. His free time interests include astronomy, amateur radio, music production and a classic Jaguar XJS. Kimberly A. Hallas is responsible for administrative, operational, and strategic coordination for Concert Asset Management. Prior to Concert Asset Management, Ms. Hallas was Director of Operations for Post Road Capital Management, LLC, where she handled client matters and office administration focusing on client relations, financial reporting, and marketing. Kim has more than 25 years experience in the accounting, entertainment, financial services, real estate, publishing, and social services industries. Previously, she was Public Relations Specialist and Assistant Editor for the Financial Accounting Foundation. Her main responsibilities included advising Board members of current and significant news developments; managing the Board’s public speaking program; developing and maintaining relationships with the media; and preparing, editing, and distributing annual reports, two monthly newsletters, and press releases. Ms. Hallas graduated from Sacred Heart University with a double major in Business Management and Finance. In her free time, she is Associate Editor with Sound Magazine and actively organizes and participates in many local art and music festivals benefitting local charities. The Concert Asset Management Advisory Board, consisting of former Principals, former clients and financial executives, and principals currently is in formation.